An artwork created by an artificially intelligent program has been sold at auction for $432,000 (£337,000). The final price is far higher than the $7,000-$10,000 estimate put on it by Christie's in New York before the sale. The painting, called Portrait of Edmond Belamy, was created by a Paris-based art collective called Obvious. The artwork was produced using an algorithm and a data set of 15,000 portraits painted between the 14th and 20th Centuries. To generate the image, the algorithm compared its own work to those in the data set until it could not tell them apart. 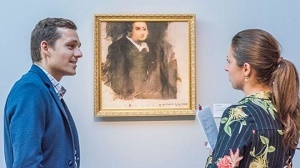 The portrait is the first piece of AI art to go under the hammer at a major auction house. The sale attracted a significant amount of media attention. "AI is just one of several technologies that will have an impact on the art market of the future - although it is far too early to predict what those changes might be," said Christie's specialist Richard Lloyd, who organised the sale.